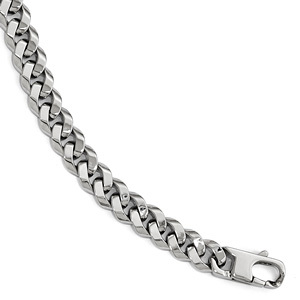 High quality, hand-made 14k white gold figaro link bracelet. 8 Inch Length, standard. Available in all lengths. Our figaro bracelets are higher in quality compared to standard machine-made link bracelets, because they are individually hand-crafted. This creates a smoother, cleaner finish and reduces the amount of air bubbles (porosities) inside the gold for a finer consistency and smooth surface. Very sturdy figaro chain with depth and thickness. These are substantial bracelets. We guarantee our 14K White Gold Figaro Bracelet - 7mm to be high quality, authentic jewelry, as described above.